During the three days of the ‘Herod and Augustus’ Conference held at University College London (21 to 23 June 2005), under the auspices of the Institute of Jewish Studies, leading experts in Herodian and Augustan studies from across the globe were brought together to present the results of their research and to engage in a constructive encounter. The event was well attended and the lectures generated lively debate. This followed on the heel of a conference at the British Museum on the theme of the ‘World of the Herods and the Nabataeans’ (17 to 19 April 2001) – the first of its type ever held in the UK – published in two volumes under the editorship of Nikos Kokkinos and Konstantinos Politis, respectively. The success of both conferences has encouraged the possibility of repeating such international gatherings in London, perhaps at four yearly intervals, like Herod’s prestigious quadrennial games. Indeed another event is being discussed for 2009 or 2010. These would considerably raise the profile of the UK in this important field of study. Through such efforts, fresh insights have been gained on developments in the cultural sphere that were fostered by the Pricipate of Augustus, and its reciprocal relationship with client monarchies, among which Herod’s Judaea occupies a prominent place. Appended below is the original programme of the 2005 conference, followed by the announcement of publication of the procceedings. 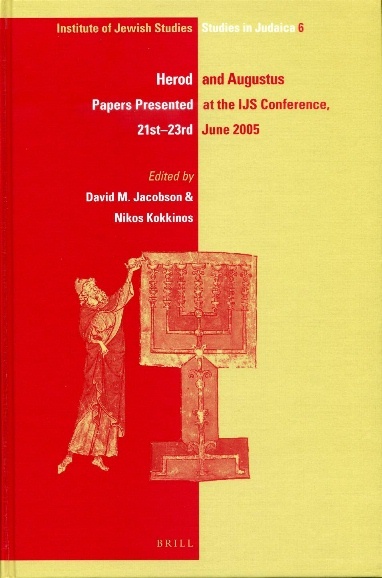 David M. Jacobson and Nikos Kokkinos (eds), Herod and Augustus (Leiden/Boston: Brill), 2008. This volume brings together nineteen studies by foremost experts in the period of Herod and Augustus, and highlights recent progress in elucidating the phenomenon of Herod the Great in the context of the Roman imperial order inaugurated by Augustus. They illuminate Herod’s pre-eminent role in the Augustan client network and his remarkable energies, expressed in an extensive building programme which has left substantial remains. The literary records of Herod’s life and times, primarily by Josephus, are critically examined here in relation to the documentary and archaeological evidence.